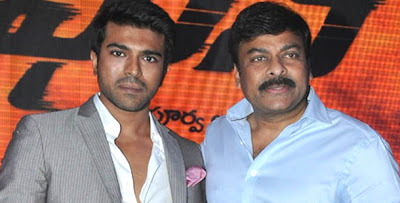 Ram Charan says his superstar father Chiranjeevi made him sign the remake of Zanjeer but is jealous of him because he could not get the opportunity to share screen space with Amitabh Bachchan. My father is a big fan of Amitabh Bachchan and always wanted to work or star in a remake of any of his film. But he didn't get the opportunity. When I got the offer, he was happy and made me sign the film. He even said that he was jealous, Ram said during the promotion of the film here. Chiranjeevi left films for politics with Ram, 28, taking his father's acting legacy forward in acting. Ram is not worried about being compared to Big B because he believes both the projects are different. I looked at it as a script. When I visited the set I got the heat of the old 'Zanjeer' but never felt pressurised. Nobody can be like Mr Bachchan. I got the offer two years ago. I was pretty scared to do the film but now I think I could not have asked for a better Bollywood debut, he said. The film stars Priyanka Chopra as Mala, Sanjay Dutt as Sher Khan, Prakash Raj as the villain Teja and will see Mahie Gill play Mona Darling. Ram says he is fan of Priyanka's acting and voice. Priyanka is a huge star. I have immense respect for her as an actor. I am a fan of her voice and acting. She was fabulous to work with, he said.